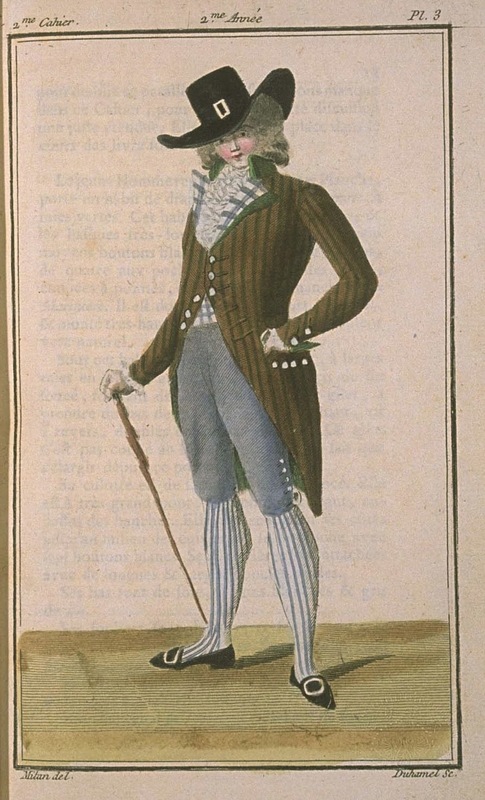 May young people not follow the fashion of the cramped and stiff attitude of the young Englishman shown in this Plate; may they feel that this young man lacks the liberty, the ease which makes grace, that the French possess more than any other Nation, and which must be recherchée at least by all the Votaries of Fashion. We only give English Fashions in order that those who will desire it will adopt the costume, which does not allow being piquant, but never in order for them to adopt the discomfort, the contortion, which would give, it is true, a foreign air, but not an agreeable and seductive one. We will never argue here whether English dress is preferable to French dress, which differed so much hardly twelve years ago; whether it makes the body better, pronounce accents better, and give it more grace: we have not yet produced enough Prints of this to establish this comparison, and we lack the space in this Book to give this discussion a fair expanse. It will find its place in the course of our work. The young Man shown in this Plate wears a coat of dead leaf colored wool, with green stripes. This coat has a very short waist, and very long basques. It is trimmed with nine square white medium buttons, on the front, four on the pockets, under the flaps, cut in points, and two on the sleeves à la Marinière. It is lined in green wool. His collar, mounted very high, is of natural green silk velvet. Under this coat, he wears a white gilet with wide vertical and horizontal stripes in dark unbleached-linen color, forming large squares. From the bottom of the chest to the top, this gilet has revers, lined with the same fabric. This gilet isn't cut at the bottom of the revers; it only gets larger from this point to the top. His breeches are of dark unbleached-linen colored satin. They have a very big fall-front, and come up very high, over the hips. They are slit on the sides to the middle of the thighs, and button with seven white buttons. His garters are attached with long and wide oval buckles. His stockings are silk, with white and unbleached-linen stripes. His shoes are open over the instep, and bear silver buckles in perfect ovals. His shirt is trimmed with a very wide jabot, and with long, scalloped ruffles. His hat à la Jockei is very high in the crown, in a half square, and has a very wide brim, trimmed with a black silk ribbon. The crown is wrapped with a wide ribbon, which passes in front through a very long silver buckle, flat and rectangular. He holds in his hand a large bamboo cane, surmounted by an ivory knob, turned in a mushroom shape. The hats à l'Androsmane are still fashionable in Paris, and M. DONNET, Merchant Hatmaker, rue St. Honoré, near the rue de l'Echelle, still continues to sell a great quantity.